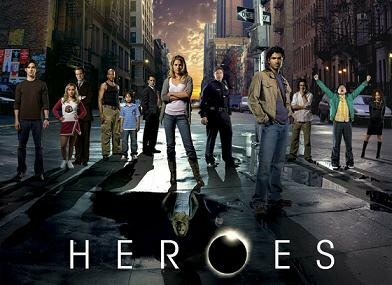 I had planned on blogging about the pilot of Touch, but it was so uninspiring that instead I’m choosing to reflect on Tim Kring‘s last, far superior show, Heroes. Touch, the drama about an autistic child with the power to see connections among disparate people, definitely had a similar feel to it, and even overlap in subject matter. But the debut of Heroes was a landmark event and the start of a fan phenomenon that lasted until the show went off the rails in its second season. After watching Touch I thought maybe I was just romanticizing, but the Heroes pilot still holds up — it’s so good. Like Touch, Heroes involves unknown connections among seemingly disparate individuals in far-flung corners of the world, people with special abilities, even a young Indian man mourning the recent loss of his father. But Heroes is just bigger. It opens by addressing human potential, the possibility that we are standing on the precipice of the next stage of evolution. Even the title, “Genesis” hints that were in for an epic tale. The pilot discloses only the first threads of what we immediately understand to be an expansive story. In case you don’t remember, in this first episode we meet, in this order, Peter (Milo Ventimiglia) and Simone (Tawny Cypress), Mohinder (Sendhil Ramamurthy), Niki (Ali Larter), Claire (Hayden Panetierre), Nathan (Adrian Pasdar), Hiro (Masi Oka), and Issac (Santiago Cabrera). Bennett (Jack Coleman) is also introduced, though he’s more of a device than a character at this point. If you watch the deleted scenes or the unaired pilot on DVD, you’ll see that they originally planned to also introduce D.L. and Ted (a different version of Ted, played by a different actor) in the pilot as well. We don’t meet Matt until episode 2. But we have our plates pretty full with the pilot cast as it is. What’s fun, and no doubt spoke to the genre TV fan base, is that the guys are all pretty big dorks. Hiro is the most obvious fanboy with his constant references to Star Trek, who finds himself in the nerdgasmic position of starring in his own comic book. But Mohinder, Peter, Ando, and to a lesser extent Issac are pretty nerdy too. Even Claire, the beautiful cheerleader is revealed to be insecure and a little awkward. Much of the pilot also revolves around a solar eclipse, which became iconic as part of the show’s logo, and had a feeble parallel in season 2 (or 3, I don’t actually remember. It was all a mush of Sylar dying and coming back to life every other episode.) The second eclipse took away the heroes’ powers, planting the idea that somehow the first eclipse gave them their powers. But this is ridiculous. Not only do we see them exercising their abilities before the eclipse even happens, but we are continuously reminded that genetic mutation underlies this type of “evolution,” and in fact, many of the characters inherited their powers from their parents. In retrospect, the eclipse has no bearing on the plot of the pilot at all. It’s more of a symbolic visual suggesting that we are all infinitesimal beings sharing a common experience on this fragile planet. It’s poetic, even if it’s a stretch to think that a solar eclipse is visible in New York and Tokyo at the same time. Although this is an ensemble cast in every sense, each episode finds its own protagonist and, in this one, it’s Peter. We begin and end with the emblematic shot of him standing at the edge of a rooftop, arms outstretched, ready to fly. Peter is trying to get off of the ground in more ways than one; he has grown up in the shadow of his successful older brother Nathan, and wants to know he has a purpose in life. The show opens with the question, can Peter really fly?, and ends with the answer. Apart from that semi-answered question, nothing but nothing is wrapped up neatly by the end of this thing. You can’t not watch the next episode, and the next. Touch, on the contrary, was wrapped up with a bow by the end of E1. I’m noticing that network television is moving in a more and more episodic direction, and I don’t like it. Do you? TV Tropes has some good Heroes analysis, including the suggestion of a “This Will Not End Well” trope inspired by this show. This entry was posted in 2000s and tagged Adrian Pasdar, Ali Larter, Hayden Panitierre, heroes, Milo Ventimiglia, tim kring, touch by meekthegeek. Bookmark the permalink.